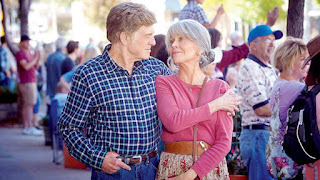 Jane Fonda and Robert Redford have not acted together since they made Barefoot in the Park in 1967—that is until this year when the two side by side worked on Our Souls at Night directed by Ritesh Batra.The film was presented out of competition at the Venice Film Festival in September and both actors received a Golden Lion Lifetime Achievement Award. The president of the film festival Alberto Barbera presented their awards and Fonda had not been in Venice she said for over 50 years. Not only are the two veteran actors but they have contributed to the film industry with their activism – Redford for the wonderful Sundance Festival and Institute and Fonda for her activism as a feminist and politically aware figure. In Barefoot in the Park written by Neil Simon, Paul played by Redford marries Corrie, Fonda. Actually their characters are somewhat similar in Our Souls at Night. Like Paul, Redford as Louis in is fussy and standoffish, whereas Fonda as Addie like her character Corrie is gushing and bubbly and trying to open up Louis. Surprisingly the film is an endearing one and the script by Kent Haruf, Scott Neustadter and Batra with quiet but effective direction makes it an enjoyable film. Both Addie and Louis are widow and widowers and live closeby. Both have grown children and memories from their former partners. As both approach 80 Addie decides to call on Louis and suggest that they sleep side by side to take away the loneliness of the nights. It is an amicable relationship between two people who barely know each other and become friends. 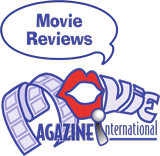 The small town they live in Colorado find out as does Addie’s son Gene (Matthias Schoenaerts)and they all have more to say on the subject than the couple in their twilight years. Shortly after they make a pact for sleepovers, Gene arrives with his son Jamie (Iain Armitage) who he is raising alone and after going through a divorce. He asks Addie if she will take care of Jamie while he works. The inclusion of Jamie in their daily life adds to the growing bond Paul and Addie is developing. 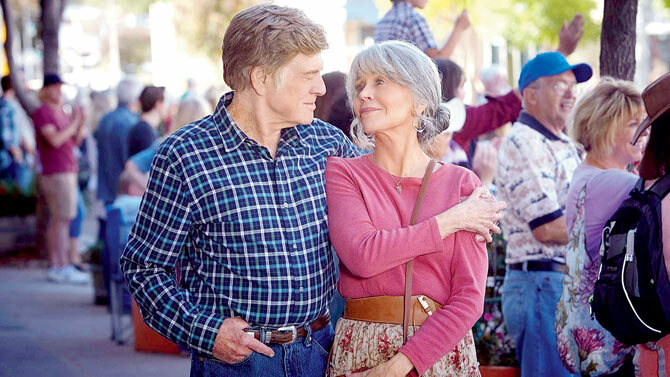 Redford and Fonda are veteran actors and bring to their film there sharp and seasoned skills, but what stands out about the film is the timing of narrative development and believable dialogue. Redford produced the film and there are many scenic scenes in the beautiful Colorado landscape.